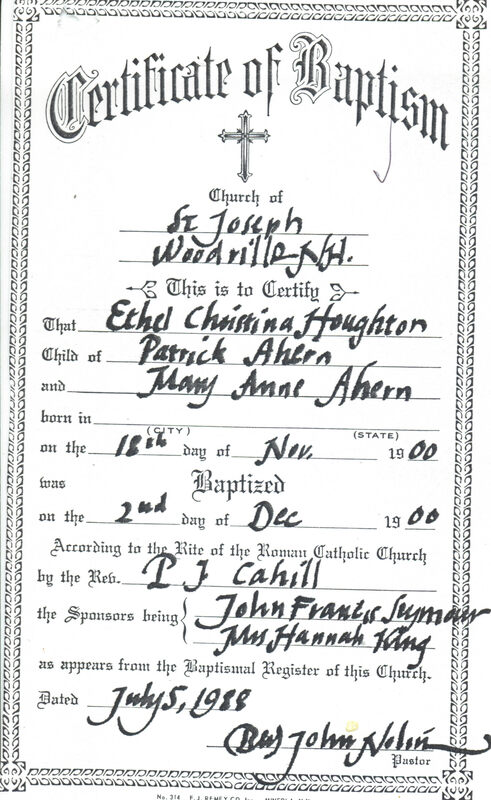 Frances Arnold Hoyt married Don Alonzo Houghton, son of John Franklin Houghton and Ella Louise Coombs, in Jun 4, 1904 at Worcester, MA, USA, mar 5 y in 1910 census. Frances Arnold Hoyt married Alfred A. Rogers. Esther M. Berg married Theodore Houghton, son of Don Alonzo Houghton and Frances Arnold Hoyt, in circa 1929 age 21. Clarisse M. Lemay married Raymond Houghton, son of Don Alonzo Houghton and Frances Arnold Hoyt, in Jul 5, 1929 at ME, USA, she 23, he 19. Clarisse M. Lemay married Irving E. Rankin. Emory Poirer married Mary Grace Houghton, daughter of William R. Houghton and Catherine A. Flynn, in circa 1924 ages 26 & 22. Mabel (?) married Sheldon Alvin Houghton, son of Sherman A. Houghton and Mary L. (? ), in circa 1901 age 20 and 18. Phoebe A. White married Julius Clifton Houghton, son of Daniel Franklin Houghton and Angie May Leavitt, in circa 1899 age 28 and 21, first mar. Gladys (?) married Andrew Houghton Jr., son of Andrew Jacob Houghton and Ida E. Wilson, in circa 1929. (?) Houghton married Carrie Chadwick, daughter of Addie Chadwick, in circa 1908 age 17. Carrie Chadwick married (?) Houghton in circa 1908 age 17. William Brown married Abbie L. Houghton, daughter of Hiram Woodbury Houghton and Irene Orcutt. Geraldine M. Houghton married Raymond Patterson. Catherine (?) married (?) Houghton.